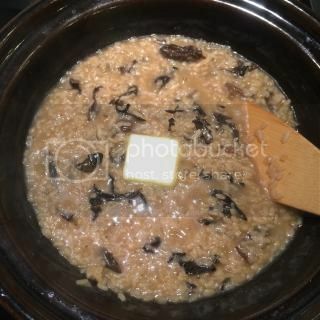 Ever since I returned from Italy, I've been crazy about donabe risotto! The shallow classic-style donabe, "Kyoto Ame-yu", is perfect for making risotto, as the shallow body can cook the rice more effectively and evenly during simmering. It makes the great presentation and also the rice stays in the right texture for a long time after the heat is turned off. 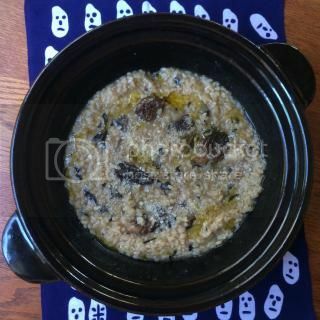 I got really nice dry morel mushrooms and black trumpet mushrooms from Sonoma, so I made dry mushroom risotto by using both kinds of mushrooms. As soon as the rice is al dente, I add the butter and Parmesan cheese to finish. The risotto becomes nicely rich and creamy. Oh, and this risotto is made from Japanese short grain rice! 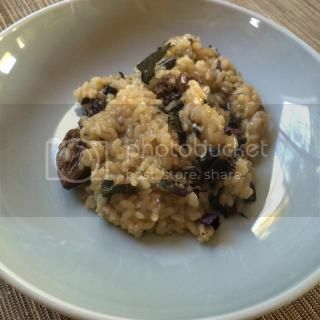 It makes really delicious risotto with the great texture. I'm so addicted to donabe risotto. And, yes, you can find the recipe in toiro kitchen's website. So, please check it out. Kamado-san Donabe on Martha Stewart Living!